The Opposition should forget about talks for a coalition government, several Jubilee politicians have said, and dismissed counterparts who called for this. Led by Gatundu South MP Moses Kuria and Kirinyaga Governor Anne Waiguru, they said the ruling coalition will not discuss a power-sharing deal. Kuria, Waiguru and others hit out at former Kiambu Governor William Kabogo and Narc Kenya leader Martha Karua, who said on Sunday that President Uhuru Kenyatta and NASA chief Raila Odinga should discuss Kenya’s future. They asked Jubilee and NASA to reach an agreement on a level playing field for the October 26 repeat vote to be a success. But Kuria said Raila is fond of seeking sympathy. The legislator asked the Opposition leader to drop his many demands and go to the ballot. He added that those claiming ballot boxes will not be transported to some areas are ill-advised. Waiguru said it was wrong for Kabogo to issue such remarks while Uhuru and DP William Ruto are busy campaigning. The Jubilee leaders have said they will not hold any talks with Raila and that foreigners including Kofi Annan, who brokered peace after the disputed 2007 election, are not welcome. Raila has also said he is not interested in sharing power. 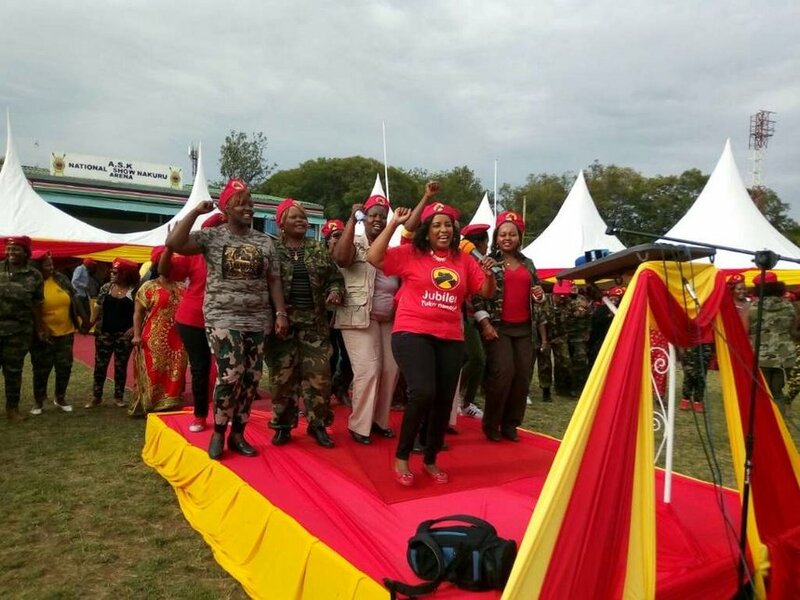 Kuria and Waiguru attended a Nakuru function of the UhuRuto women’s brigade alongside lawmakers Naomi Shaban, Cecily Mbarire, Susan Kihika and Millicent Omanga. Jayne Kihara (Naivasha), Charity Chepkwony (Njoro), David Gikaria (Nakuru Town East), Nakuru Assembly Speaker Joel Kairu and friends of the campaigners also attended. The politicians defended Parliament for changing electoral laws saying this was for Kenya’s good. They said most shortcomings pointed out by the Supreme Court will be addressed by the amendments. The President has been criticised for approving laws in his favour. He received Elections Laws (Amendment) Bill, 2017 last Friday for consideration and signing. The leaders asked women to go to the grassroots to campaign for Uhuru and Ruto. Kihika noted women are in a better position to campaign because they are more persuasive than men. Former Nairobi woman representative Rachel Shebesh said: “It has become clear that Raila loves politics based on ethnicity. We will take him home once and for all. Ruth Wanjiku, a representative of women at the grassroots asked the Opposition not to hold demonstrations in Nakuru. The leaders also condemned politicians diving Kenyans on tribal lines.